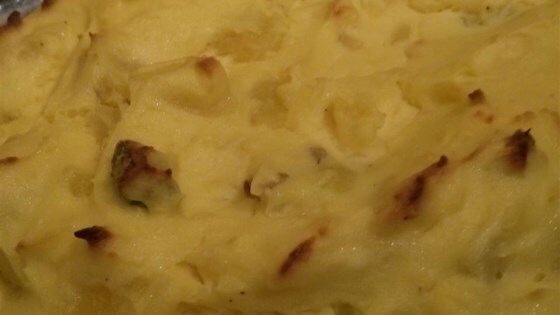 "The most amazing mashed potatoes you'll ever have! A little cream cheese, scallions, and Tabasco®! Absolutely divine! It takes a little time, but well worth it. Don't go too light on the Tabasco®, it really adds GREAT flavor!" Preheat oven to 350 degrees F (175 degrees C). Grease a baking dish with butter. Place potatoes into a large pot; add enough water to cover and bring to a boil. Reduce heat to medium-low and simmer until tender, about 20 minutes; drain. Whip potatoes, cream, cream cheese, and egg together in a large bowl; season with hot sauce, salt, and pepper. Fold scallions into the potato mixture and transfer to the prepared baking dish. Bake in the preheated oven until heated through and fluffy, about 45 minutes. See how to make perfect instant mashed potatoes. I really enjoyed this! I love the texture and the flavor! I didn't have light cream on hand, so I had to substitute milk and butter for that part. Definitely a make again for me!